At The Lambos Firm, LLP the emphasis is on finding creative solutions for problems that plague businesses in these competitive times. Our reputation lies in our ability to bring parties together to resolve disputes without unnecessary legal intervention. This is achieved through a proactive approach to our client's needs by seeking to protect them from potential exposure by thoughtful strategic planning. However, when litigation is unavoidable, our clients appreciate The Lambos Firm, LLP's reputation for vigorous and tenacious advocacy. The hallmark of the firm is its proven experience in handling clients' legal matters successfully and cost-effectively. 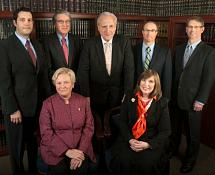 The firm has an active trial practice, jury and non-jury, in federal and state jurisdictions. The Lambos Firm, LLP has an extensive appellate practice, including successful U.S. Supreme Court advocacy. In addition, our attorneys are also actively engaged in non-judicial dispute resolution for a including arbitrations, mediations, and administrative proceedings. The Lambos Firm, LLP is a firm with deep ties to the maritime community that are manifested through active participation in long-standing maritime associations and support of charitable causes important to the industry. The attorneys of The Lambos Firm, LLP are dedicated and fully committed to serving the interests of the maritime community as well as recognizing the excellence the community brings out in its own.